He's still in court facing charges for the murder of his girlfriend but that didn't stop him from having an incident at a nightclub when a man confronted him about the trial. Don't think this will be good for his case. According to reports, Oscar went to a nightclub in Pretoria on Saturday night with his cousin & after some drinks, allegedly insulted South Africa's president Zuma and started acting "aggressive." He was allegedly pushed into a chair after he poked another clubber in the chest who asked him something about his trial. "We can confirm that Oscar was at a night club with one of his cousins. They sat in a quiet area of the private VIP section when they were approached by the individual you have identified as Mr Mortimer." "The individual in question, according to our client, started to aggressively engage him on matters relating to the trial. An argument ensued during which our client asked to be left alone. Oscar left soon thereafter with his cousin. Our client regrets the decision to go into a public place and thereby inviting unwelcome attention," she added. 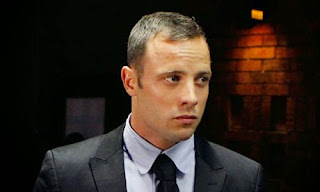 According to reports in South Africa, Jahed Mortimer, was the man involved in the clash with Pistorius at the night club and he later told reported that Pistorius was drunk and very aggressive. He said he only pushed Oscar into a chair after Oscar poked him in the chest and only confronted him after Oscar insulted President Zuma. Moritmer claims his best friend is Zuma's son Duduzane. Jared, who is a little famous in some parts of SA, said he entered the vip area of the club as he recognised one of his friends, who then introduced him to Oscar. "Oscar knew one of my friends and said, 'Oh, you are the infamous Jared Mortimer." Jared said "He immediately started talking about his friends and how they had backstabbed him. He mentioned Justin Divaris and Darren Fresco. He then mentioned one of my friends and claimed he had a lot of dirt on that person." "He was going on about how influential his family is and how connected they are. He even pulled out his phone to show me pictures of armoured cars. "He said 'My family owns SANDF. Zuma works for us. I'll p*ss on Zuma." SANDF is The South African National Defence Force. "He said you'll never get the better of me. I'll always get the better of you," Jared claimed Oscar started poking him on the chest and aggressively pulling his neck to talk to him. Jared then pushed Oscar causing him to fall over and prompting club security to intervene. Oscar then left the club.